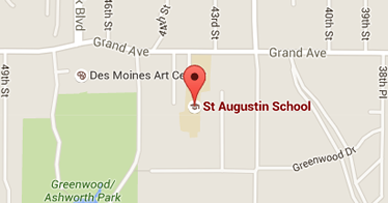 Welcome to the St. Augustin Catholic School Band news page. I am excited to meet my new musicians for the 2018-19 school year. Please check out the "About Mrs. Paul" page to get to know me better. Check back to this website throughout the year for news and updates about what is happening with the St. Augustin Catholic School Band. We will begin lessons when school begins. Full Group 5th grade band rehearsal will not begin until October, but lessons will begin right away. We need to have about 4 lessons to be ready to play as a full band. We will have a Christmas concert, a concert in May, and an All-Parochial school concert in January. I will send a full calendar to band parents/guardians as soon as the dates are set. Students need to have their instruments rented by Monday, August 27th. This is the day we will begin lessons. They also need Essential Elements 2000 beginner band book for their instrument. There is only 1 secret to doing well in band...PRACTICE! The bottom line is the kids that practice will do well and in turn feel good about their progress and continue to practice. The kids that do not practice regularly will end up quitting because every year more skills are built upon the first ones they learn. The kids that practice more at home will rise to the top of their sections.